Madame de Graffigny was a pretty ungrateful house-guest, but her correspondence provides a valuable description of the interior of Cirey which, alas, was totally destroyed in the Revolution. 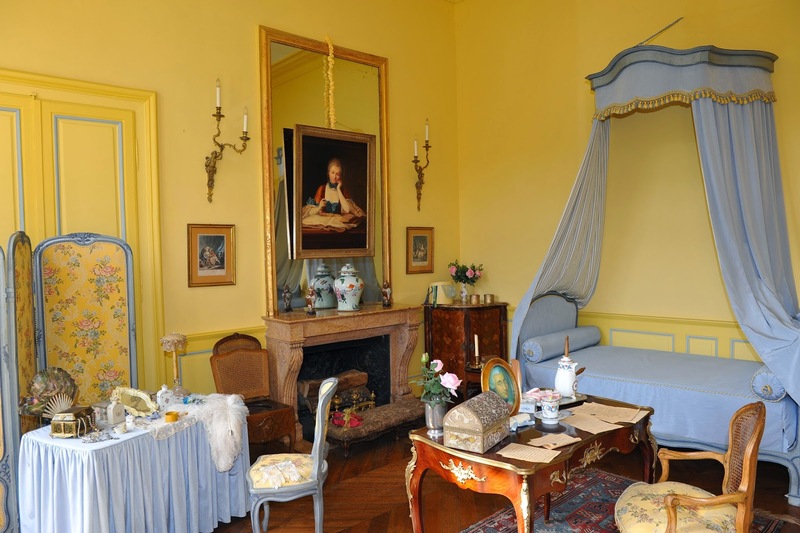 In 1738, when she visited, renovations were still very much in progress, Voltaire and Émilie's intimate and finely appointed apartments contrasted markedly with the bare and cold quarters to which guests found themselves banished. Even the catty Madame de Graffigny could not withhold her admiration for the comfortable luxury of the newly refurbished rooms. Her account gives an interesting insight into eighteenth-century taste. 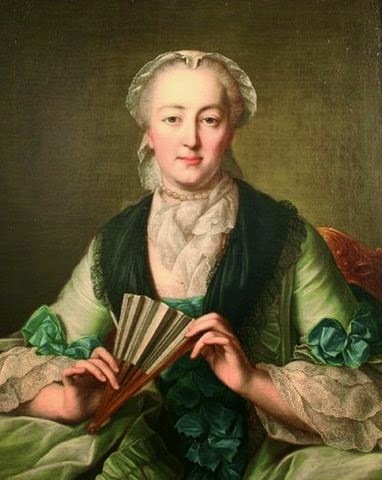 Today's commentators would concentrate much more on overall design; Madame de Graffigny tends to catalogue fine objects - furnishing, sculptures, even boxes of rings and jewellery. It is a world where the paraphernalia of everyday upper-class life are difficult to make and expensive to acquire. Interesting too, that Voltaire despite the intimate setting, could not resist the opportunity for self-advertisement; adorning statues with "famous epithets" of his own composition. The present owners of the chateau have beautifully recreated Madame du Châtelet's bedroom and renovated the library, so it is possibly to gain an idea of its former glory.
" His little wing is so close to the main part of the house that the door is at the bottom of the chief stair- case. He has a little ante-chamber as large as your hand; then comes his own room, which is small, low, and upholstered in crimson velvet, a cosy corner done the same with golden fringe. It is winter furniture." The window of this room looked out upon a meadow crossed by the river Blaise. On opening a door he could hear Mass said - a concession to the conventions. 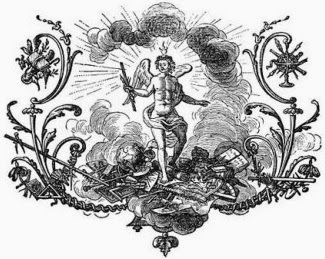 The walls of his rooms were wainscoted, and in the panels pictures were framed; mirrors, beautiful lacquered corner-cupboards, porcelain marabouts, a clock supported by marabouts of a peculiar shape, an infinite number of ornaments, expensive, tasty, and everything so clean that you could kiss the parquet ; an open casket containing a silver vase ; in short, everything which was luxurious, and therefore necessary, to Voltaire. What money! What work! He had a case for rings, which held two dozen with engraved stones, as well as two set with diamonds. This was not finished ; there was to be a sculptured niche for the Cupid which would hide the front of the stove. The gallery walls were panelled and painted yellow. Clocks, tables and desks were in profusion. Nothing was wanting. Beyond was the dark room for experiments in physics. Nor was this finished. There was also to be one for instruments, which at that time were kept in the gallery. Everything but physical comfort was catered for, for there was only one sofa, and no padded arm-chairs. Voltaire was no lounger. The panels of the wainscoting were hung with beautiful India paper, and there were screens of the same. A door led directly into the garden, and there was a pretty grotto outside. Could any Idol have found a more perfect temple ? Yes; but only one. The Idol's idol. Her rooms were still more beautiful, even more recherché. 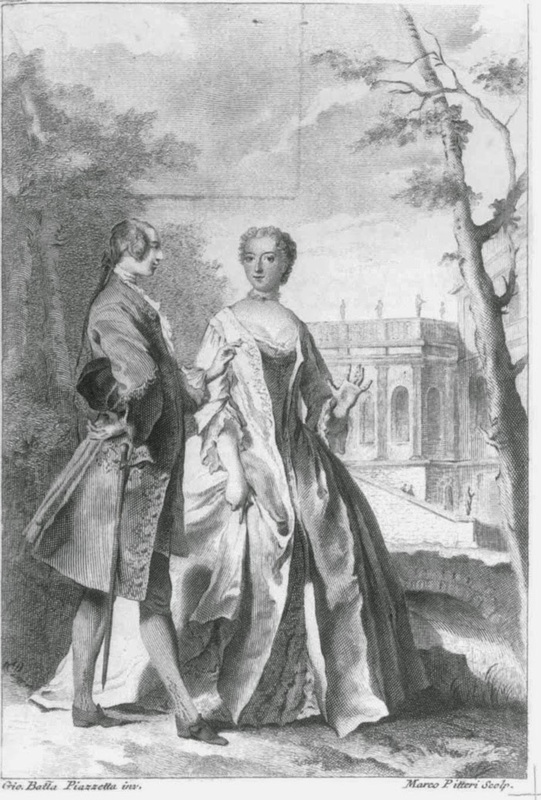 Mme de .Graffigny visited them in the company of their mistress. The bedroom was panelled in wood and varnished in light yellow relieved with edges of pale blue. That was the colour scheme, and everything harmonised even the dog's basket. The bed was of blue watered silk; the wood of the arm-chairs, the chest of drawers, the corner-cupboards, the writing-desk, all yellow. The mirrors, set in silver frames, were all polished and wonderfully brilliant. A large door made of looking-glass led to the library, which was not yet furnished. Then there was Madame's boudoir, a really eighteenth- century boudoir, which made one feel ready to go down on one's knees and worship at the shrine of beauty. The wainscoting was blue, and the ceiling was painted and varnished by a pupil of the famous Robert Martin. In the smaller panels were pictures which Mme de Graffigny thought were painted by Watteau, but which were really by Pater and Lancret. The chimney-piece and corner-cabinets were loaded with treasures, amongst others the wonderful amber writing-desk which was a present from Prince Frederick. There was an arm-chair upholstered in white taffetas, and two stools of the same. This divine boudoir had an outlet through its only window on to a terrace, from which the view was charming. There was one other apartment which received attention from everybody concerned. It was the bathroom. In those days a bathroom was apparently not in constant use for its legitimate purpose. We hear of the fair Emilie taking a bath when she was expecting Desmarets to arrive at Cirey no doubt as a kind of welcoming ceremonial. Certainly this room was occasionally used as a drawing-room. It was so like the study that perhaps confusion arose on that account. Emilie dated one of her letters to Algarotti from "la chambre des bains' and Voltaire held a reading there, behind closed doors, as though his poetry took on an added flavour from the mystery of the surroundings. If we are to believe. Mme de Graffigny, the apartment was a work of art in itself. She goes into ecstasies over it.
" Ah, what an enchanting place ! The antechamber is the size of your bed ; the bathroom is tiled all over, except the floor, which is of marble. There is a dressing- room of the same size, of which the walls are varnished in sea-green, clear, bright, lovely, admirably gilt and sculptured ; furniture proportionate : a little sofa ; small and charming arm-chairs, of which the wood is in the same style, carved and gilt ; corner-cupboards, porcelains, prints, pictures, and a dressing-table. The ceiling is painted ; the room looks rich, and very much like the study ; there are mirrors and amusing books on lacquer tables. All this seems as though it were made for the people of Lilliput. No, there is nothing prettier; for this retreat is delicious and enchanting. If I had an apartment like that, I would be wakened at night for the pleasure of looking at it I have wished for you to have one like it a hundred times, because you have so much good taste in little nooks of this kind. It is certainly a pretty bonbonnière I tell you, because the things are so perfect. The mantelpiece is no larger than an ordinary arm-chair, but it is jewel enough to be put in one's pocket."